Students are gearing up for May's i2P Youth Expedition Utah! Dinosaurs, Geology and epic running!!! 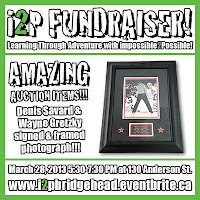 i2P Fundraiser - Half Way SOLD OUT!! 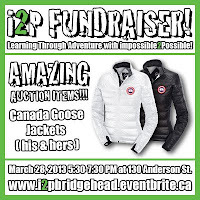 We are now over half-way SOLD OUT for the i2P Fundraiser! 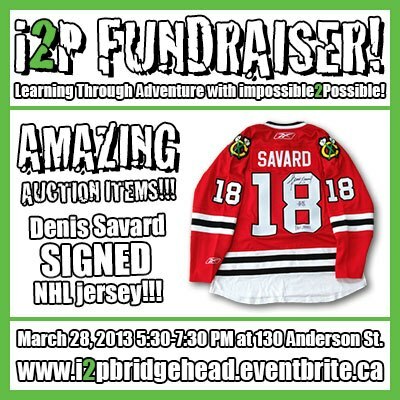 Join us on March 28th at the Bridgehead Roastery for your chance to hear Ray Zahab & two i2P Youth Ambassadors share their stories & experiences in pushing themselves to their limits and learning about cultures from around the world. 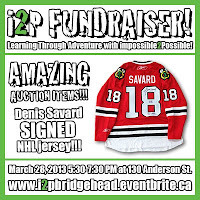 Buy your tickets TODAY at www.i2pbridgehead.eventbrite.ca! Check out the list of auction items too!! Hanging on the West Coast! 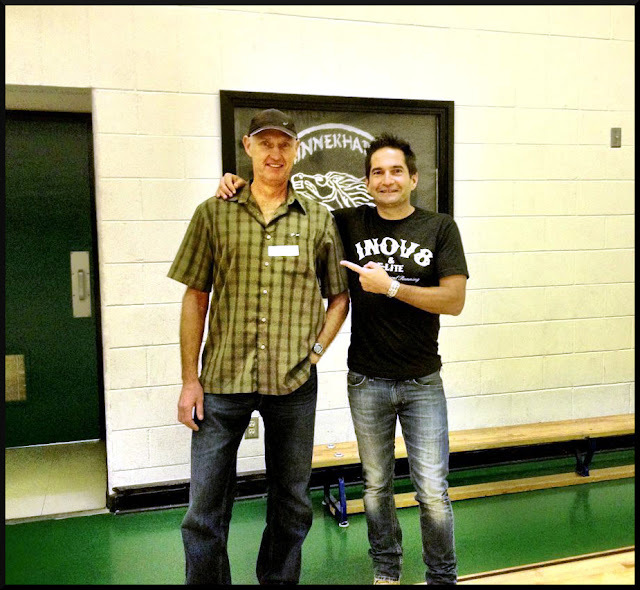 It was great to be in Vancouver for 22hrs speaking at Minnekhada School with Ferg Hawke about i2P Youth Expeditions, the 400+ students had HUGE energy and great questions!! Then it was on to some Gobi training with Ferg!! Each year, I commit to completing a few significant expeditions, including youth-based programs with impossible2Possible (i2P), as well as my own crazy adventures running across some remote part of the globe. For example, i2P’s Expedition Utah has us joining the Youth Ambassadors in running a marathon a day for seven days across some of the most rugged terrain any i2P team has ever attempted. In addition, i2P teammate Ferg Hawke and I will attempt to run across the Gobi Desert at its widest point in summer – approximately 2,000 km – with limited support this June. No one is born with all of the skills and habits needed for these sorts of adventures - every one of them requires making changes and commitments that I believe help me to achieve my own personal goals. Any runner will tell you that our goals are progressive; we all make commitments and set goals in the hopes of achieving a desired outcome. So how do we get there? You need to map out a plan. The key to success in any plan is being realistic about the steps in this plan. One of the greatest benefits of training so many incredibly driven people towards achieving their personal goals – whether it be running their first 5K or running across an entire continent – are the lessons I learn from all of them about how to best take these steps. These lessons come from every session, program or outcome – lessons like resiliency and flexibility. Resiliency in training means remembering that nothing is achieved overnight. Most of us know this, but in our low points it can be diffiult to remember! Some of the greatest rewards will come from the sheer will to forge ahead in the toughest of times, pushing through the moments when breaking down seems like the easier alternative. I have always said “some of our greatest challenges are 90% mental...and the other 10% is in our head.” The ability to be resilient and not get into a ‘negative funk’ during training will be what carries your training to the next phase. Being flexible in training can mean so many things. It can obviously be literal, meaning to be more limber! But in this sense, I mean that while it’s essential to have goals, if injury, exhaustion or even sickness, are seen as a failure, there’s not enough flexibility in your plan. You need to be able to bend around these occurrences and modify the plan if need be. During World War II, Churchill once said, “Never, ever, ever, ever give up.” This doesn’t mean being rigid and sticking to the plan to the detriment of the end goal. It means making positive decisions to modify plans in the short term, while always being cognizant of your end goal, in order to ensure your future success. When I am formulating programs for people, I ask them not only for their end goals, but also for the smaller – but no less important - changes and commitments that they are willing to make. Then we recreate their programs around keeping those commitments. I mainly do this because by completing their goals and fulfilling their commitments, they are more likely to feel empowered to take the next steps in their training. And when people encounter challenges and setbacks that forces them to demonstrate resiliency and flexibility, success is even sweeter! Join Ray Zahab, founder of impossible2Possible (i2P), along with Tracey Clark & Gina Becker, founders & proprietors of the impressive coffeehouse & roastery Bridgehead, and Mark Sutcliffe, Ottawa Citizen Columnist for a fun-filled evening of expedition stories from Ray Zahab and i2P Youth Ambassadors over cocktails at the Bridgehead Roastery! It promises to be an unforgettable evening, which will include a fabulous LIVE and silent auction, with all proceeds going toward i2P's Youth Expedition Utah 2013! 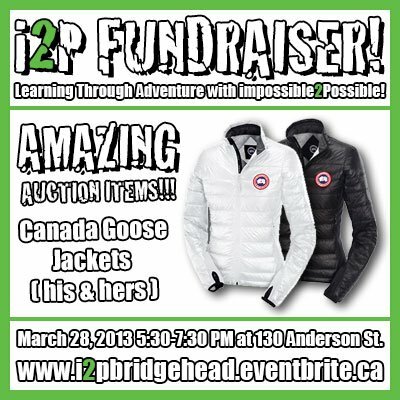 Silent auction items include: his and hers Canada Goose jackets, Oakley sunglasses, NHL memorabilia, running & adventure gear, a spa package, Sens tickets, and so much more! 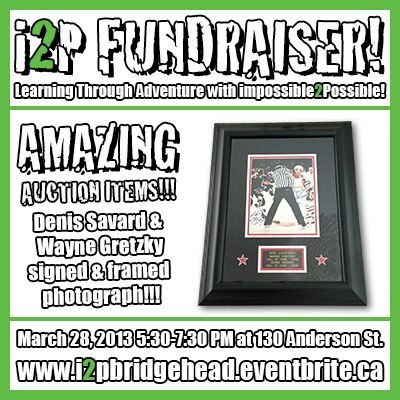 please go to http://i2pbridgehead.eventbrite.ca! Register today! Tickets are selling fast! Ferg Hawke and I have been training very hard this past year for our upcoming attempt to run across the Gobi Desert. The run will take us across Mongolia and into China! Our journey will be a minimum of 2,000km, and the way our exciting route is shaping up, it seems as if we are adding mileage to the route daily! Our goal is to cross at the widest point possible and it will be very remote. We will rely on minimal daily resupplies (we will be unreachable at some points) and will try to manage 80km per day in our attempt. More exciting news to follow, including the passionate film crew following us and special announcements! Stay Tuned!!!! It seems I always start everything with....sorry it has taken me so long to write! I have been away in Guatemala filming/hosting a new reality series titled The Project for the past 8 weeks. More about that in the future, but it will air on major networks this fall!!! I am excited to announce the upcoming Youth Expedition this May to Utah! Be sure to follow our incredible Youth Team as they run an average of a marathon per day in the Grand Staircase, navigating this remote wilderness. The subject of Expedition Utah will be Dinosaurs and Geology...who doesn't dig that? No pun intended!